Well not exactly, but CAN your door open properly and easily for anyone with a physical challenge? Being able to just get in the door of many businesses can be difficult for some people, but when one has a physical issue, just opening the door can be a real problem. Any caring business wants to make sure potential customers can and will come inside their establishment to browse, purchase, and enjoy their products and services. So having a business with a physical door or set of doors that can open easily by only the individual trying to come inside is the first key to getting a happy customer. Having an employee on board to help with opening the door, or having a note on the door explaining what to do, is considered by many to be an insult. What person with dignity wants to have to ask for help with what is considered a normal daily function? The first thing a business needs to do is make sure that the doors to their customers are functionally easy to open for everyone who would like to enter. 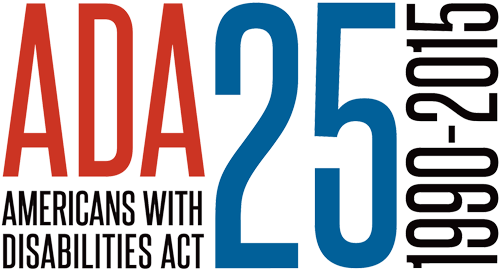 With 2015 being the 25th anniversary of The Americans with Disabilities Act (ADA), it's a good time to take a look at how the current law and subsequent regulations, as currently implemented, affect small businesses. The ADA is a Federal mandate for non-discrimination of all people, and requires that public accommodations are provided by all government entities and private businesses to make their goods and services accessible to everyone. Although you may hear that the ADA does not apply to your small business, the ADA affects all public and commercial buildings and storefronts, whether publicly or privately owned. The current ADA Standards for Accessible Design (sometimes referred to as ADAAG) which were updated in 2010, became partially effective on March 15, 2011 and fully effective on March 15, 2012 and apply to all businesses. The 2010 ADA Standards for Accessible Design (and the preceding 1991 Standards) require that public accommodations designate certain accessible architectural features. There is, however, a 20-year safe harbor for structures built or remodeled between 2002 and March 15, 2012 that used the previous set of 1991 design standards for construction or renovation. Many states and municipalities have enacted their own disability access laws and regulations with which businesses must comply, some of which parallel the ADA regulations and some that do not. The key in each case is to perform due diligence to meet or exceed the requirements with a defined evaluation process on the physical structure and layout of your business. 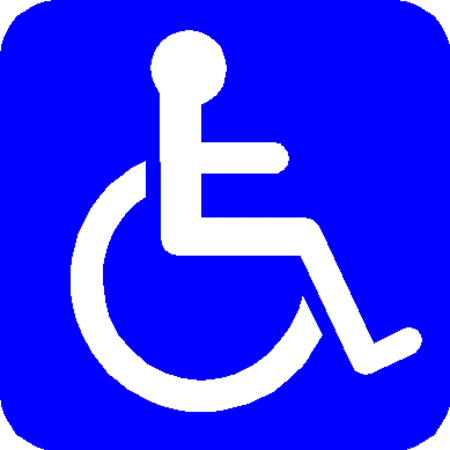 Displaying on your front door or window the International Accessible Icon that has been widely used for years, or preferably its modified replacement, provides a welcoming visual notice that anyone can access your place of business. 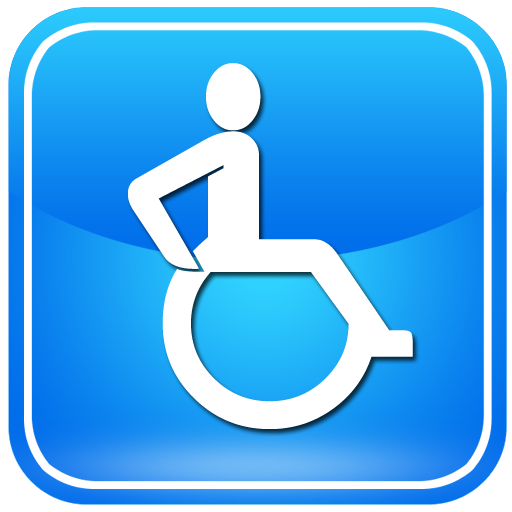 Notice how the graphic has been changed to create a much more active reflection of a person self-propelling in a wheel chair, reflective of the actual abilities of the person, rather than the previous stationary design. 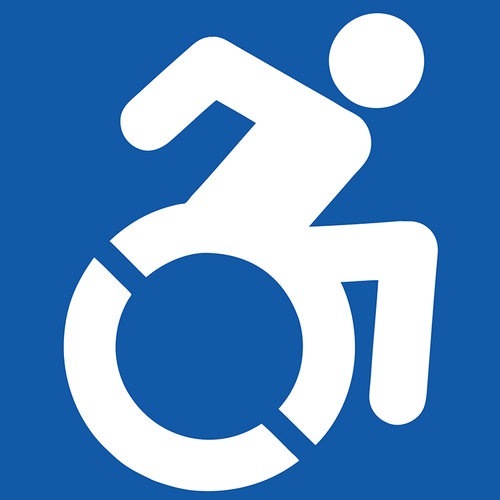 The third graphic is the general design of the new International Symbol of Accessibility (ISA), with the graphic on the window of Marshalls being a version of that design with more of an active appearance reflecting the rolling of wheels. 1. The entryway to your store and your aisles should be wide enough for a wheel chair to turn around and should not be crowded with boxes or displays items that one would have to maneuver around. Many big box stores now place displays in their aisles to market new products and fill up floor space in the check-out areas. Also avoid packing clothes racks too close together. 2. The door to your business should be openable with minimal effort. The style of glass doors shown to the right are often very hard to open even for an average person. Consider replacing any door that is hard to open or installing an electronic assist mechanism. 3. If your store contains floors at different heights on the same level, make sure that ramps between the floors are properly sloped and outfitted with a railing. 4. Your check-out and service counters should have a reduced height section that is accessible to someone in a wheel chair for easy transactions. 5. As most physical businesses provide restroom facilities either in their store or nearby in the larger building, make sure that the restroom is accessible, has a door that can be opened by someone with a disability, and is designed and outfitted inside to be accessible "and usable" to a person in a wheelchair or with any other type of disability. The standards for accessible restroom design are quite complex, so make sure that someone experienced in the regulations reviews the design plans, implementation, and the actual functionality of the features. Finally, make sure that movable objects do not obstruct entry, exit or functional access to each accessory. Many times, the folks who clean unknowingly end up moving objects into positions that limit access to sinks, towel racks and other accessories. 6. Restaurants have additional functional points to look at and maintain. Do you have regular and bar tables in every different section of the restaurant that are functionally usable for a person with a physical disability? Table requirements provide for space underneath that is 30” wide, 17” deep and 27” high, with a maximum table top height of 34". If you have a salad bar or other similar do-it-yourself food or accessory areas, is it at a level for a person in a wheel chair, or usable for a person who is sight impaired? 7. Make sure you have an emergency evacuation plan for every customer and employee who may be in your store. An effective plan should be designed or reviewed by safety and disability professionals, as persons with various types of disabilities can react to an emergency in different ways. Practicing the plan at least annually and with each new employee will result in any potential emergency being managed with haste and efficiency, protecting all occupants. Some simple courtesies can make a real difference in the experience of your customers with disabilities resulting in customer satisfaction. If a customer requests that you provide additional assistance or physically change something in your store or its layout then listen to the request and consider the request seriously. Many people with disabilities know the laws by heart so there may be a legal requirement behind their request. Customer comments and feedback are a great way to learn about customer needs and how accessible your business actually is, or needs to be. Listening and then following up to verify, act upon, and potentially modify your business should be seriously considered to prevent a potential lawsuit by an individual or governmental entity. What MHBI Can Do For Your Business? 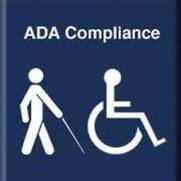 Note that following the steps above does NOT guarantee that you will be in compliance with the current ADA business requirements, as they are quite complex in certain areas. Hiring a professional to design, evaluate and functionally test the accessibility of your business space is an important investment should you receive a customer complaint. MHBI can evaluate and functionally test the accessibility of your business from the entry doors through your entire space and guide you in proper courtesies to those who may enter your business. MHBI provides review and analysis services to restaurants and small businesses in both new and existing locations. We also provide reviews of design plans, and of structures that are under construction to verify that the installations maintain proper standards. MHBI feels that the oversight we provide will give you the confidence and satisfaction to manage your business knowing you can service all customers to your establishment. The ADA regulations provide guidelines and details on designing new and modifying existing buildings to provide equal services for individuals with disabilities. For more information see the ADA Guide for Small Businesses or the Resource Links below. U.S. Access Board - Accessible Routes - NEW!